Dr. Victor R. Michalak offers both surgical and non-surgical cosmetic procedures to help you achieve your desired look and gain the confidence you deserve. If you are looking to remove stubborn fat deposits, add fullness to your lips or remove bags from under your eyes, Dr. Michalak possesses the skills, knowledge, expertise you require from a trusted cosmetic surgeon. Dr. Michalak is also an expert in laser’s that are used to improve sun-damage, scars, redness, rosacea and pigmentation. 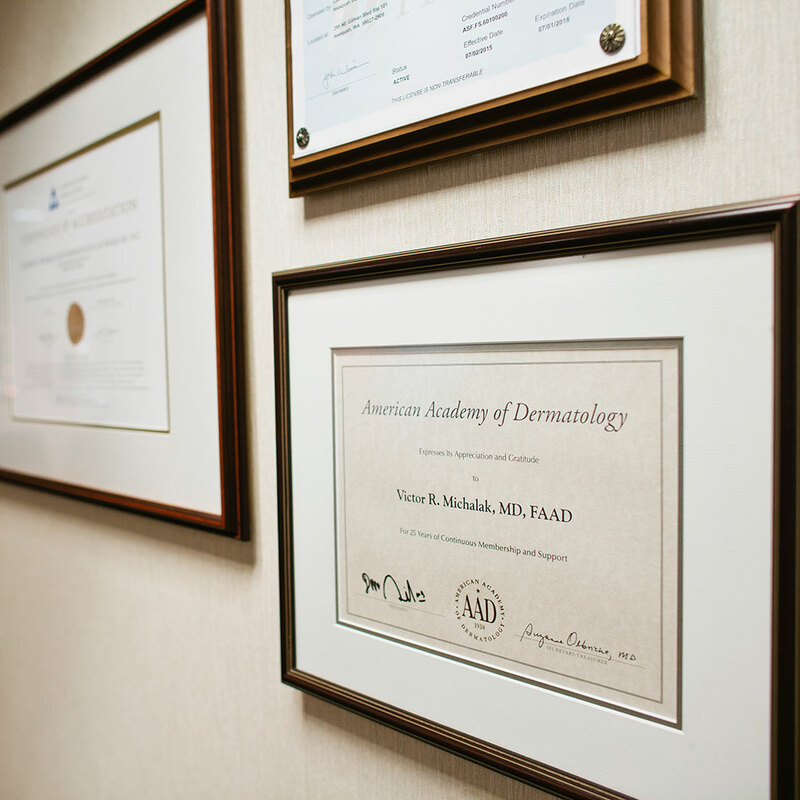 Cosmetic Surgery & Dermatology of Issaquah has been serving the Issaquah, Bellevue, greater eastside area for years. If you are in the Seattle are you can eliminate frown lines without surgery and without scar through a simple treatment using Botox® Cosmetic. By using very small doses of BOTOX®, injected directly into a specific facial muscle, the action of that muscle will be relaxed. Therefore, the problem that muscle causes, like a twitch, spasm or frown line, will be stopped. Treatment in our greater seattle area office takes only a few minutes and the BOTOX® takes effect in three to four days. Gradually over three to five months the results will fade, and the muscle action will return. Injectable fillers are used to replace volume loss of the face, fill in scars, rejuvenate hands, lessen the depth of nasal folds and lifting cheeks. Lips injections are popular creating fullness or correcting upper lip lines that can make you look older. Some of the types of fillers we use include: Restylane, juvederm, Radiesse, Beloter, Sculptra, and Voluma. This technique of liposuction uses a combination of laser energy and tumescent liposuction to remove unwanted fat deposits as well as tighten loose skin. It can be used for breast reduction, bra fat, gynecomastia, upper and lower abdomen, flanks, buttocks, inner and outer thighs, arms, knees, and neck area. Tumescent Liposculpture is a safe, quick recovery procedure performed with only local anesthesia. This form of lipo surgery is best for patients in relatively good health with some stubborn fat deposits. If you’ve been fighting to lose your double chin, Kybella may be the answer. Offering an alternative to chin liposuction. The Kybella solution is injected beneath your chin into the excess fat. Once injected, the substance works to destroy the underlying fat cells. It is a non-surgical FDA-approved fat melting procedure to help get rid of that stubborn double chin and achieve safe results that are both beautiful and appear completely natural. This treatment called subscision smooths away dimples and reduces the appearance of cellulite for long-lasting, natural results. This treatment is great for those who don't need to remove excess fat through liposuction. Rather are looking for a more youthful texture and tone. UltraShape is a non-invasive fat reduction treatment that works to shape and contour the body, while also destroying stubborn fat cells. UltraShape is the first and only FDA-cleared, non-invasive body-shaping procedure that uses focused, pulsed ultrasound for selective fat-cell destruction. Patients report that it is virtually painless and results will be noticeable in as little as a month. You can expect to need three treatments spaced two weeks apart. Fraxel laser treatment improves your appearance by applying columns of laser energy, affecting only a fraction of your skin at a time with thousands of microscopic laser spots. Fraxel is ideal for patients who are bothered by conditions such as fine lines around eyes, uneven pigmentation, brown spots, age spots, acne scarring, and more. CO2 Fractional Laser Resurfacing provides the greatest amount of improvement for wrinkles around eyes, mouth, and other wrinkles and scars of the face. The results are immediate contraction of collagen fibers with improvements in uneven skin texture. Skin laxity is noticeably improved with less down time than regular laser treatments, featuring Active FX and Deep FX. Laser Dynamic Therapy is using a topical photosensitizing agent and laser in combination. This technique is non-wounding with minimal downtime providing an alternative for patients producing a rejuvenating affect on the skin unlike any other treatment. LDT is recommended for patients with skin conditions such as acne, sun damage, enlarged pores, and rosacea. We use a variety of techniques to lighten and reduce the appearance of scars. Scars caused by acne, surgery, or trauma can be reduced or eliminated over repeated sessions. Those "tired look" dark circles can be gently treated and usually eliminated with little to no downtime using our Alexandrite Laser and other methods. Ultherapy is a non-surgical rejuvenating treatment that uses ultrasound energy which tightens and lifts skin tissue. Eyelid surgery is recommended for sagging eyelids, removal of fatty pouches beneath the eyes and removal of excess skin from the upper eyelid. This procedure is the most effective treatment for broken capillaries, rosacea, facial and leg spider veins, new scars, red birthmarks, port wine stains, and is also used for rejuvenation and has minimal to no downtime. This procedure is used to lighten the appearance of brown (sun) and age spots. It is the most effective way to lighten those individual brown spots and dark circles. Problematic spider veins and varicose veins can now be removed with laser vein treatment. These veins appear on many areas of the body, although the legs are the most common area of concern. By applying energy to the unwanted vein, it dissolves and disappears. The procedure may be performed alone or in combination with sclerotherapy. Both methods are effective for treating spider veins of the legs.